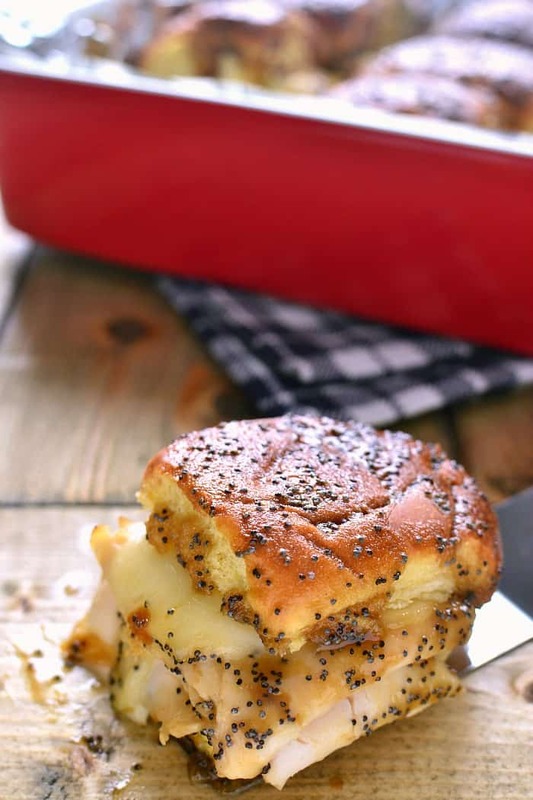 These Baked Turkey and Cheese Sandwiches are a family favorite! These delicious make ahead appetizers are perfect for game day, dinner, or your next party! So did I ever tell you what Santa got us for Christmas? I don’t think so….partially because I didn’t want to jinx it! See, Santa got us a trip to a waterpark….which was supposed to happen the 3 days right after Christmas. Except that Jorden was deathly ill….and, much to the girls’ dismay, our trip was postponed until now. The good news? We got to look forward to it for 2 weeks! And when I say look forward to it, I mean the girls. Because let’s be honest. Waterparks are totally for kids. But. I must say. After the weekend, I stand corrected! We had a BLAST at the waterpark! Possibly because Santa was generous and got us the family suite, or possibly because we finally found a waterpark where I wasn’t shivering the entire time we were there. Or it might have had something to do with the mimosas at breakfast and french fries at dinner…..!? It definitely wasn’t because of the $18 movie we rented. The Good Dinosaur? Have you seen it? Holy sad movie for kids!!! But that’s a discussion for another day. The truth is, we let loose for a few days, and it felt great. And now…..back to reality! And I’m completely cringing at the thought of it. Who wants to go back to a busy week filled with schedules and responsibilities after hanging out at a waterpark for 3 days? Not me! 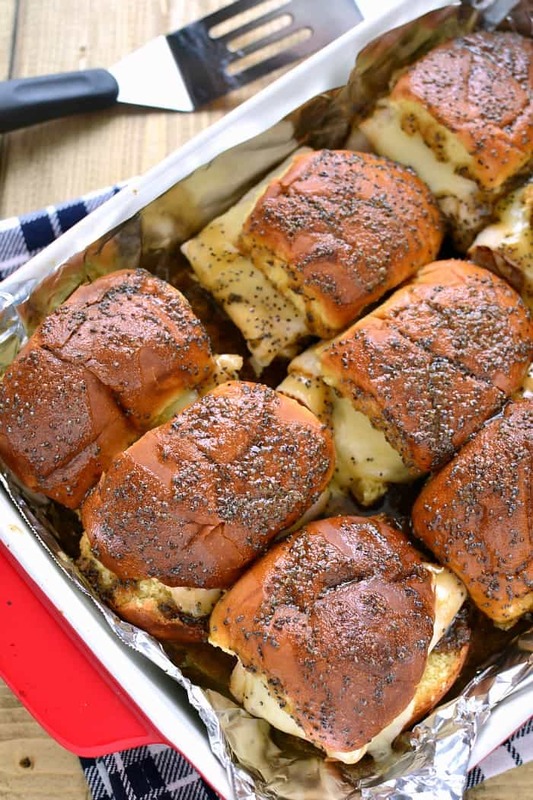 One thing I know for sure is these Baked Turkey Sliders will definitely be making an appearance on the weekly menu. 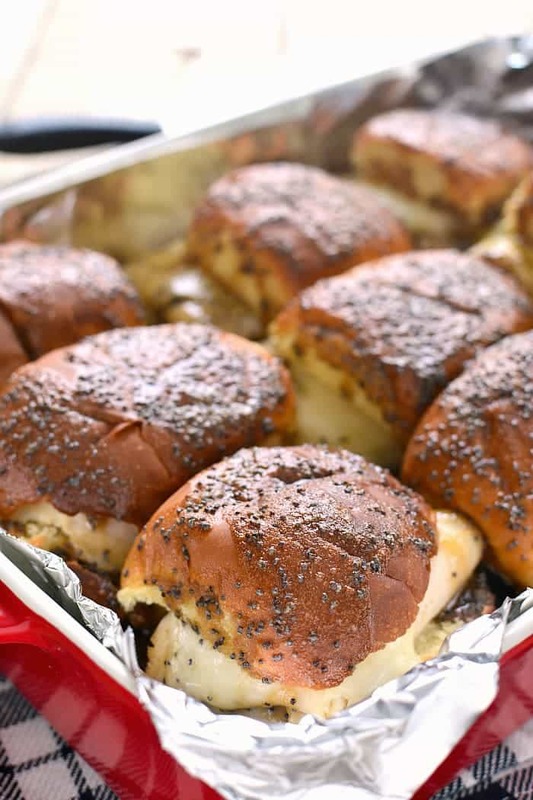 Not only are these Turkey and Cheese Sliders quick and easy and meant to be prepared in advance (my favorite kind of meal)….but best of all, everyone loves them! And I mean everyone. They’re one of our favorite things to serve at parties and get togethers, and once you try them, you’ll see why! As for the recipe, it’s a variation of a recipe my sister passed on to me years ago, and there are lots of variations floating around the internet. Of course, I tend to think these Baked Turkey & Cheese Sandwiches are the BEST ones out there. And I have the feeling you’ll agree. 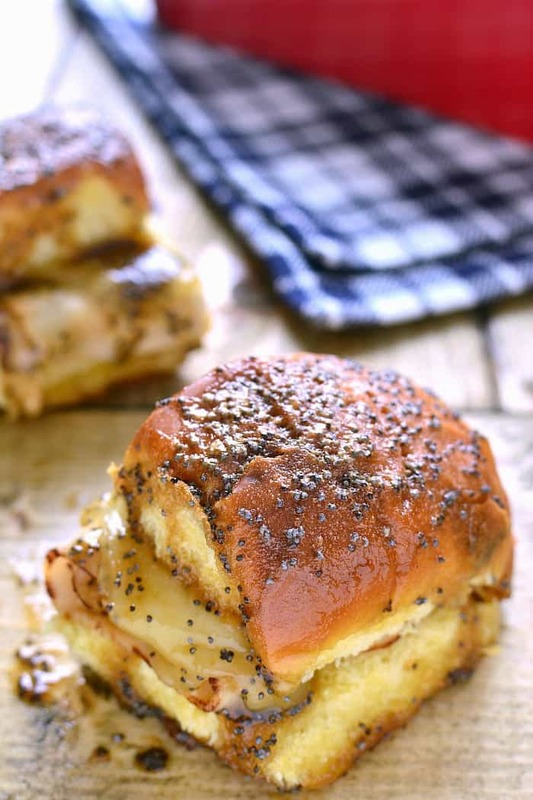 These Baked Turkey & Cheese Sandwiches are a family favorite! Make them ahead for game day, dinner, or your next party! Prepare sandwiches by dividing turkey and cheese evenly among buns. 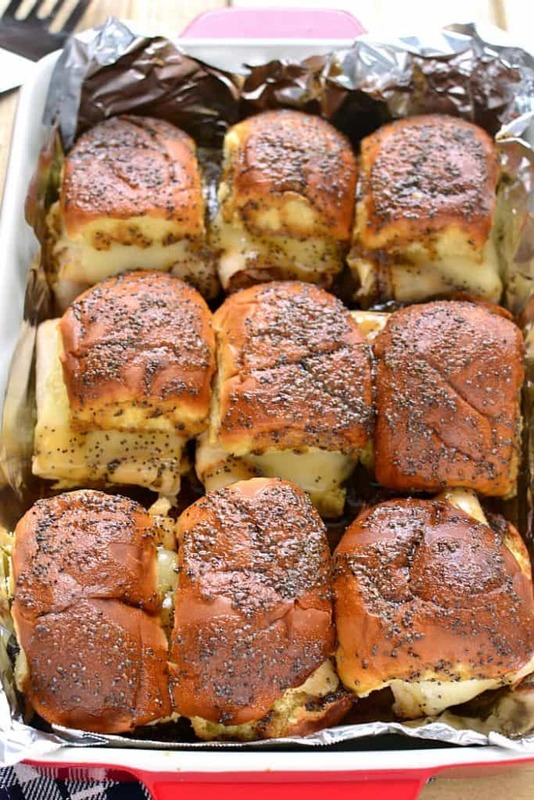 Place sandwiches on a rimmed baking sheet lined with aluminum foil. In a small saucepan, combine remaining ingredients. Bring to a boil over medium-high heat. Remove from heat and pour over sandwiches. Uncover sandwiches and bake at 350 degrees for 20 minutes. Check out Mandy’s Recipe Box for a great BBQ Turkey Meatloaf recipe! I am getting so hungry looking at these! 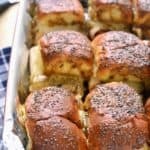 I make a similar sandwich and they are perfect party food! I love the addition of the poppy seeds on top! Thanks so much, Kristine! We made them for my daughters’ birthday party last year and everyone LOVED them. I love all the different variations! Nope it’s not it’s crispy. Not enough sauce to soak bottom. Thanks Megan….and you’re totally right! These would be great with soup! 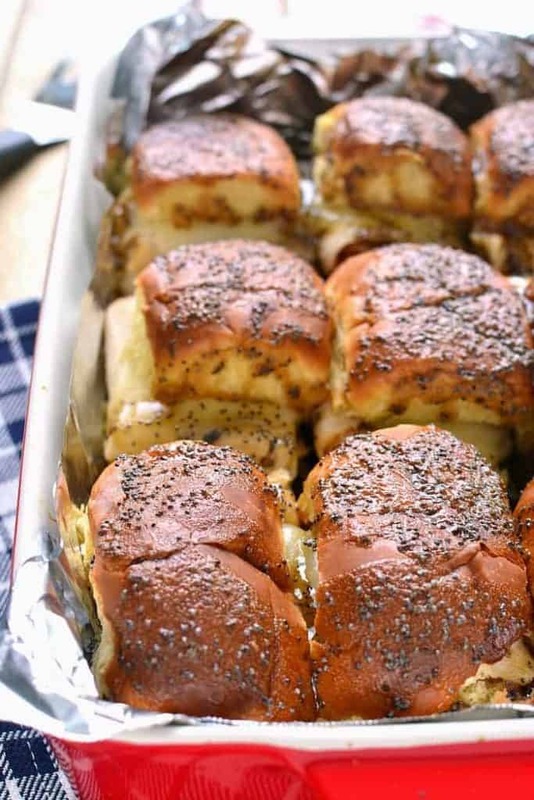 I love these sandwiches with ham but turkey is my JAM so hello, these need to be mine! Also I’m a poet and I didn’t know it. HA! Love it. Turkey is my jam too!! Mini sandwiches have become a party staple for me. I love that you added the poppy seeds! And destination or activity Santa gifts are the best ones: memories!! I feel like mini sandwiches are the way to go! And yes….I hope Santa ALWAYS gives activity gifts! Baked sandwiches are the best! My kids love to help make them and then devour them! So good! My 4 year old helped make these! I love that about them, too! Ohmygosh! I made a version of these over Christmas, and they’re so good! I looooove the brown sugar in your recipe! Can’t wait to try these again! Oh boy, does this look delish. Perfect for on the go. Thanks, Miryam! Definitely a perfect meal for busy days and nights! These look absolutely amazing, Cathy – I just want to reach through my screen and snag one! Oh my goodness Cathy these sandwiches sound amazing! I’ve tried something similar with ham, but I must get my hands on these! Also, what waterpark did you guys go to? Sounds like so much fun! And not cold? Genius! These look so good! I want to make them for church potluck. Are they best straight out of oven or would they be okay to be baked and eaten a little bit later? How far in advance can these be made and refrigerated before serving? Do you think you could refrigerate them for a day and a half before baking or do you think the bread will get soggy? I’m making them for a reunion. It’s Friday night and I would like to serve one pan Saturday and one pan on Sunday. Suggestions??? Our realtor brought these over when we got our keys to our new house and they were awesome! Totally easy to pop in the new oven and we didn’t need any utinsils for them! I’m so happy I found the recipe since I keep forgetting to ask her. What an awesome realtor! I’m glad you found the recipe, too!! Hi Cathy. Do you pour the juice over the sandwiches while it’s hot or do I let it cool? Also, if it’s hot do I refrigerate right away or after they’ve cooled? Hi Derralyn, sorry for the delay! You can pour the sauce over the sandwiches while it’s hot, then cover and refrigerate as soon as you’d like. No need to let anything cool in between. Hope this helps! Thank you for the recipe. We used leftover turkey rather than deli meat and this was way too sweet for us with the brown sugar in addition to the Hawaiian rolls that are already sweet. I’d recommend those like us that don’t care for sweet sandwiches to omit the brown sugar. The other flavors were great with the turkey. I am still waiting to see someone answer all the questions about if the sandwiches are soggy or not?????? Hi Faye, these sandwiches are actually best when prepared in advance, then covered and refrigerated overnight and baked the following day. Hope this helps! I would like to know about them getting soggy as well. I want to make these Friday and need to make them in advance on Thursday night. Will that work ? Hi Leah, YES! They’re best if prepared the night before and covered/refrigerated overnight. Looking forward to trying these but I am wondering if you refrigerate overnight with the sauce does the bread become soggy or does it dry out in the oven when heated? Thanks! Are these better using sweet rolls or plain? Thanks you! I have made this several times, and everyone absolutely loves them. Thank you for sharing! So happy to hear that, Jen! I love a recipe to try when I get soooo hungry looking at the photos! These sandwiches look wonderful 🙂 Thanks for sharing. THese are delicious. However my spouse does not like the greasy bottom, messy fingers. Is there anyway to avoid this feature? Thanks. So from all the comments, I take it these are just meant to be soggy on the bottom. These are sitting in the fridge now in two 8×8 pans and one will go into the freezer and the other will be baked tomorrow. I did eliminate the brown sugar as hubs doesn’t like sweet mixed with savoury and also substituted sesame seeds for the poppy seeds since he is a commercial driver and cannot eat poppy seeds and still pass his normal drug testing. When I bake, I’ll place the pan on the lowest rack so the bottom crust has the best chance to crisp and hopefully eliminate the sogginess that would normally come from the dairy solids in the butter plus the worcestershire sauce. Love the combination of flavours that your version of this snacky sandwich has and think it will be just delicious! Thank you! What kind of rolls do you use? I love this recipe! My second time making it tonight for the Chiefs game tomorrow hopefully it’s a hit with everyone! These we so popular with my friends, they insist I make them for every get together. I’ve made them at least 5 times this year! I also do a batch with Ham & Swiss. I add little mayo to buns as well. A few of my six children prefer turkey to ham, so I’ll be making a pan of these to go along with my ham and swiss sliders. Thanks for the recipe! Thanks so much. This is a great recipe-I made it for a luncheon and people really liked it. I left out the poppy seeds (responding to no-seed requests) and added a slice of ham. I first made these with chicken cutlets and gruyere. They were a hit. I’m making them tonight with ham and muenster. This is such a versatile recipe. If you are looking for something that is low WW points, keep looking! However, they are worth the splurge. No they do not get soggy, have a crispy crust top and bottom. Delicious!